Enter the building by the entrance from the car park – it is under a curved roof, illuminated and there is a sign for the “Minor Injuries Unit”. Go through the entrance door and straight ahead passing the reception desk on your right (this area is the minor injuries unit reception so it will look like a hospital/doctor’s reception and waiting area). Turn right into the corridor towards the main reception area. At the end of the large main reception desk on your left, turn left and go through the door on your left marked for the stairs and lift. Go to the first floor, enter through the double doors and diagonally towards your left you will see the double doors to the “Lynne Barthorpe Room” just behind a pillar. It is a lot easier to do than to explain! 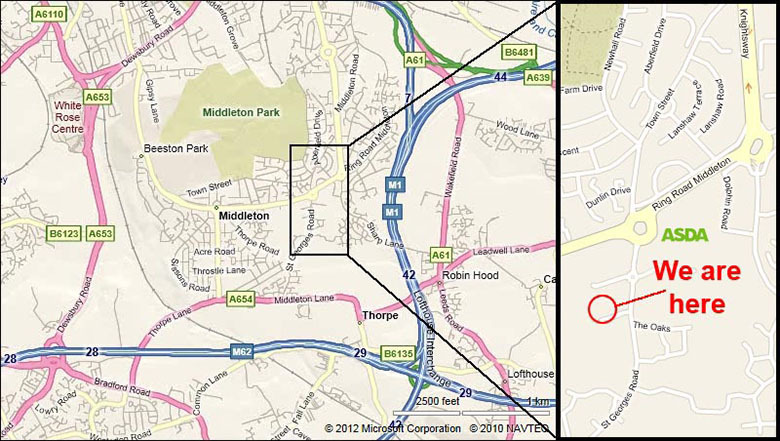 Travel on A1 or M1 until your route intersects with M62. Travel west on the M62 to junction 28 (M62) and follow the signs for the A653 into Leeds After about 1½ miles the A653 forks right. Stay with the A653 until you reach a set of traffic lights about a ¼ mile further on. Turn right at these lights (the Tommy Wass Public house is on the left hand corner) and continue along this road for approximately 1½ miles until you reach the first traffic roundabout by the Asda superstore. Take the third exit off the roundabout up St George’s Road. Cross the roundabout by the entrance to Asda and get into the right hand turn lane to the St George’s Centre car park. The St. George’s Centre is a modern building with a curved roofline. Leave the M62 at junction 28 and follow the signs for the A653 into Leeds. After about 1½ miles the A653 forks right. Stay with the A653 until you reach a set of traffic lights about a ¼ mile further on. Turn right at these lights (the Tommy Wass Public house is on the left hand corner) and continue along this road for approximately 1½ miles until you reach the first traffic roundabout by the Asda superstore. Take the third exit off the roundabout up St George’s Road. Cross the roundabout by the entrance to Asda and get into the right hand turn lane to the St George’s Centre car park. The St. George’s Centre is a modern building with a curved roofline. Follow the signs for the M621 in the direction of the M1 or London and join the Motorway noting that the appropriate exit is junction number 6 for Middleton (This exit is only available for vehicles travelling South on the M621, it is not available when travelling North). Turn right onto Belle Isle Road. Carry straight on through the traffic calming measures and continue straight on at the first large roundabout. At the second roundabout turn right onto Middleton Road. Continue for some 200 yards until you reach a traffic roundabout by the Asda superstore where you turn left into St George’s Road. Cross the roundabout by the entrance to Asda and get into the right hand turn lane to the St George’s Centre car park. The St. George’s Centre is a modern building with a curved roofline.